Nikos and Fotis meet again. Bilbao announced the signing of Nikos Zisis(1.96-PG/SG) via their official website for the next season and also with an option for another season. Nikos Zisis and Fotis Katsikaris meet again after about 8 years when the 2 of them were part of AEK Athens in the good old days of AEK. 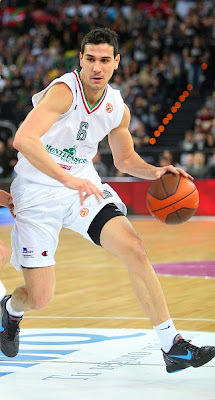 Zisis left Siena, where he played for the last 3 seasons. It's not guaranteed that he will be playing in the Euroleague next season but Zisis wanted to be in a place where he would feel comfortable and how could be not in Bilbao with Katsikaris, Mavroeidis and Vassiliadis all members of the same team. Last season he averaged 6.4 points 2.1 rebounds and 2.7 assists in 42 games in LegaA1 winning the league title once more for Siena. In the Euroleague he averaged 4.5 points 1.7 rebounds and 2.7 assists in 20 games. Zisis and the other Bilbao playes are now in Venezuela trying to secure a place in the Olympic Games for the Hellenic National Team. Sito Alonso a candidate for Olympiakos?